Reading and share top 19 famous quotes and sayings about Apparitions by famous authors and people. Browse top 19 famous quotes and sayings about Apparitions by most favorite authors. 1. 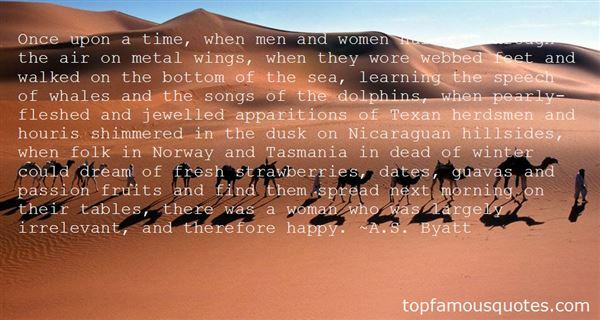 "Once upon a time, when men and women hurtled through the air on metal wings, when they wore webbed feet and walked on the bottom of the sea, learning the speech of whales and the songs of the dolphins, when pearly-fleshed and jewelled apparitions of Texan herdsmen and houris shimmered in the dusk on Nicaraguan hillsides, when folk in Norway and Tasmania in dead of winter could dream of fresh strawberries, dates, guavas and passion fruits and find them spread next morning on their tables, there was a woman who was largely irrelevant, and therefore happy." 2. "Not thou alone, but all humanity doth in its progress fable emulate. Whence came thy rocket-ships and submarine if not from Nautilus, from Cavorite? Your trustiest companions since the cave, we apparitions guided mankind's tread, our planet, unseen counterpart to thine, as permanent, as ven'rable, as true. On dream's foundation matter's mudyards rest. Two sketching hands, each one the other draws: the fantasies thou've fashioned fashion thee." 3. 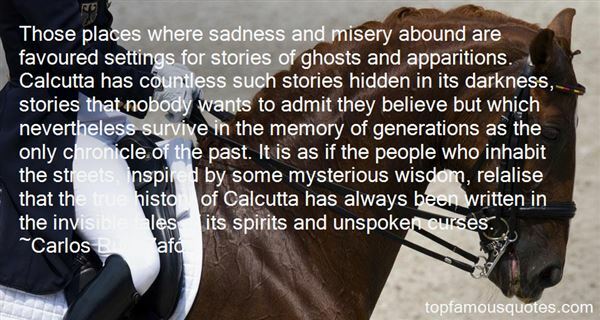 "Those places where sadness and misery abound are favoured settings for stories of ghosts and apparitions. Calcutta has countless such stories hidden in its darkness, stories that nobody wants to admit they believe but which nevertheless survive in the memory of generations as the only chronicle of the past. It is as if the people who inhabit the streets, inspired by some mysterious wisdom, relalise that the true history of Calcutta has always been written in the invisible tales of its spirits and unspoken curses." 4. "The large, gaping flaws in the construction of the stories--mad wives in the attic, strange apparitions in Belgium--are a representation of the life she could not face; these gothic subterfuges represent the mind at a breaking point, frantic to find any way out. If the flaws are only to be attributed to the practicce of popular fiction of the time, we cannot then explain the large amount of genuine feeling that goes into them. They stand for the hidden wishes of an intolerable life." 5. "GhostsTake shape under moonlight,materialize in dreams.Shadows. Silhouettesof what is no more. Butghosts don'tbother me. The day bringsbigger things to worry aboutthan flimsy remains ofyesterday. No, spooks don'tscare me.Gauzy apparitions mightprank your psyche oragitate your nightmares,but lackingflesh and bloodthey are powerlessto hurt you-cannot hopeto inflict the kind of damagethat real, livepeople do." 7. "I was too much taken up with another interest to care; I felt beneath my feet the threshold of the strange door, in my life, which had suddenly been thrown open and out of which came an air of a keenness I had never breathed and of a taste stronger than wine. I had heard all my days of apparitions, but it was a different thing to have seen one and to know that I should in all likelihood see it familiarly, as I might say, again. I was on the lookout for it as a pilot for the flash of a revolving light and ready to generalise on the sinister subject, to answer for it to all and sundry that ghosts were much less alarming and much more amusing than was commonly supposed. There's no doubt that I was much uplifted. I couldn't get over the distinction conferred on me, the exception - in the way of mystic enlargement of vision - made in my favour. ("Sir Edmund Orme")"
8. 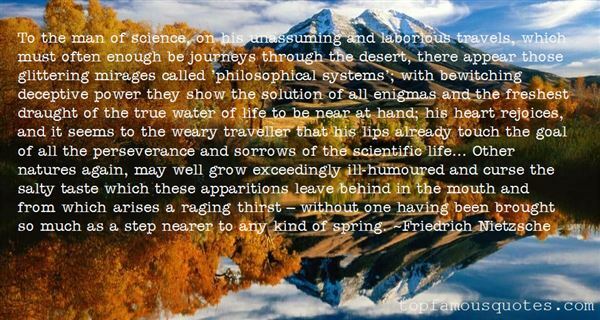 "...though leaving him always to remark, portentously, on his probably having formed a relation, his probably enjoying a consciousness, unique in the experience of man. People enough, first and last, had been in terror of apparitions, but who had ever before so turned the tables and become himself, in the apparitional world, an incalculable terror? He might have found this sublime had he quite dared to think of it; but he didn't too much insist, truly, on that side of his privilege." 9. "Literary characters, like my grandmother's apparitions, are fragile beings, easily frightened; they must be treated with care so they will feel comfortable in my pages"
10. "And then I recalled those mysterious stories about the waxworkers of the middle ages and the public reprobation attached to their trade. Did they not live in cellars, in the eternal twilight propitious for enchantments and apparitions? Their visionary art (who, more than they, evoked a truer image of life?) was closely related to that of magicians: bewitchments were carried out with wax figures, witch trials are full of them, and one particular legend haunted me above all, that of the modeler from Anspach, who slowly squeezed the soul and the life out of his model in order to animate his painted waxwork and then, having finished his work of art, awaited nightfall to go and bury the corpse in the ditch at the city walls." 11. "He would have admired one of those fantastic visions, those magic apparitions one sometimes sees in the great theaters of Europe, in which the deafening melodies of an orchestra are made to appear among a deluge of light, a torrent of oriental diamonds and gold surrounded by a diaphanous mist, from which a deity, a sylph comes forward, her feet barely touching the floor encircled and accompanied by a luminous cloud. In her wake flowers shoot forth, a dance bursts out, harmonies awaken, and choirs of devils, nymphs, satyrs, spirits, country maidens, angels, and shepherds dance, shake tambourines gesticulate wildly, and lay tribute at the goddess's feet." 12. "The sun was up, the room already too warm. Light filtered in through the net curtains, hanging suspended in the air, sediment in a pond. My head felt like a sack of pulp. Still in my nightgown, damp from some fright I'd pushed aside like foliage, I pulled myself up and out of my tangled bed, then forced myself through the usual dawn rituals - the ceremonies we perform to make ourselves look sane and acceptable to other people. The hair must be smoothed down after whatever apparitions have made it stand on end during the night, the expression of staring disbelief washed from the eyes. The teeth brushed, such as they are. God knows what bones I'd been gnawing in my sleep." 13. "The only sign of war was a cloud of dust migrating from east to west. It looked through the windows, trying to find a way inside, and as it simultaneously thickened and spread, it turned the trail of humans into apparitions. There were no people on the street anymore. They were rumors carrying bags." 14. "Thomas Wolfe warned in the title of America's great novel that ‘You Can't Go Home Again.' I enjoyed the book but I never agreed with the title. I believe that one can never leave home. I believe that one carries the shadows, the dreams, the fears and dragons of home under one's skin, at the extreme corners of one's eyes and possibly in the gristle of the earlobe.Home is that youthful region where a child is the only real living inhabitant. Parents, siblings, and neighbors, are mysterious apparitions, who come, go, and do strange unfathomable things in and around the child, the region's only enfranchised citizen. […]We may act sophisticated and worldly but I believe we feel safest when we go inside ourselves and find home, a place where we belong and maybe the only place we really do." 15. "I saw the spiders marching through the air,Swimming from tree to tree that mildewed dayIn latter August when the hayCame creaking to the barn. But whereThe wind is westerly,Where gnarled November makes the spiders flyInto the apparitions of the sky,They purpose nothing but their ease and dieUrgently beating east to sunrise and the sea;"
16. "A night of full moon is favourable to tales of apparitions." 17. "Words, those precious gems of queer shape and gay colours, sharp angles and soft contours, shades of meaning laid one over the other down history, so that for those far back one must delve among the lost and lovely litter that strews the centuries. They arrange themselves in the most elegant odd patterns; the sound the strangest sweet euphonious notes; they flute and sing and taber, and disappear, like apparitions, with a curious perfume and a most melodious twang." 18. "The illimitable, silent, never-resting thing called Time, rolling, rushing on, swift, silent, like an all-embracing ocean-tide, on which we and all the Universe swim like exhalations, like apparitions which are, and then are not: this is forever very literally a miracle; a thing to strike us dumb—for we have no word to speak about it." 19. "Our apparitions, the things you know us by, are simply childish. Beneath it is all dark, it is all spreading, it is unfathomably deep; but now and again we rise to the surface and that is what you see us by." The Catholic men are more upset about women not being able to be priests than are Catholic women."